Take the elevator to this wonderful end unit with covered parking and convenient neighborhood pool. Enjoy stunning views of Bohicket Creek from the rear porch. High tide brings numerous sea birds while low tide has oysters 'clipping shut' in their beds. The unit is designed for a wonderful vacation experience and is within walking distance of tennis and the Lake House fitness center. You’ll also enjoy the beautiful beaches, nature trails and bike paths all over the island. The dining area flows into the vibrant living space with dual ceiling fans, a spacious sectional, plenty of local reading material, numerous board games and a media center with a flat screen TV equipped with Comcast cable and capable of streaming Netflix and Hulu programs. SECURE WIFI IS ALSO INCLUDED. Sliding doors open to the dual ceiling fan porch where guests can relax and enjoy a light meal at the café table or cocktails in the cozy seating area overlooking the marsh. The master bedroom with ceiling fan features a queen bed with a luxurious cool gel memory foam mattress and hotel-quality linens. The attached bath has a beautiful walk in shower and marble top vanity with ample storage. The guest bedroom with adjacent bath has a ceiling fan, 2 twin beds and a lovely private deck area of its own overlooking the palm trees. The laundry has a Full-size washer & dryer, iron, ironing board, cleaning supplies etc. For your beach visits you’ll find a cooler, beach cart to carry chairs, & umbrellas and multiple beach towels all included. OPTIONAL AMENITY CARDS ARE AVAILABLE FOR PURCHASE AT $25 PER DAY OR $150 FOR THE WEEK. These will provide access to Seabrook Island Club facilities and can be obtained at the Amenity Office behind Seabrook Island Real Estate. The Beach Club with panoramic views of the Atlantic Ocean with expansive sunbathing decks magnificently landscaped around two ocean-front pools. During peak season, the Beach Club offers complimentary towel service. 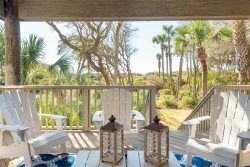 The Club house, The Pelican's Nest, an ocean-side restaurant and bar and The Seabrook Shoppe, offering snacks, drinks, beach sundries and apparel. The Racquet Club, boasting 15 professionally maintained clay courts available year-round, a full-service Pro Shop, and indoor and outdoor lounge areas overlooking the courts. Private Golf Courses--Two private courses are available for play: Ocean Winds, a par 72 course designed by Willard Byrd; and Crooked Oaks, a par 72 course designed by Robert Trent Jones, Sr.
Island Dining--The island hosts a variety of dining options: Bohicket Lounge & Sea View Terrace, a relaxed and casual lunch and dinner restaurant overlooking Crooked Oaks & Ocean Winds golf courses, featuring upscale southern cuisine focused on fresh/local seafood and ingredients; Palmetto Room, with spectacular views of the Atlantic Ocean, serves dinner and Sunday brunch in a more formal dining venue offering fresh local fare adding southern flair to American favorites. The Pelican's Nest, a casual ocean-side outdoor dining experience with a full bar serving lunch and dinner with live music every Friday and Saturday night. This is a popular place to grab a casual bite or to enjoy a sunset dinner with family and friends. Absolutely fabulous!! Clean, cheery, comfy! !